Entrepreneur and daredevil Richard Branson has a message to working parents seeking more time with their children: Work from home. "I'm a great believer in people working from home. I encourage our staff if they want to work from home," the founder of the Virgin empire says in a new podcast episode of CNN's Boss Files with Poppy Harlow. That's how Branson balanced spending time with his two children, Holly and Sam (now grown), while constantly spanning the globe and running his business. Of course, being his own boss helped make that possible. For many parents, working from home is not an option. 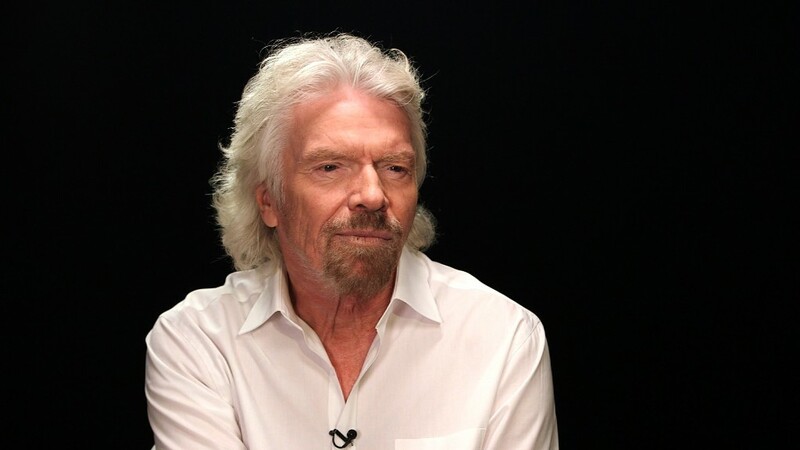 But Branson, it seems, is encouraging other companies to allow their employees this flexibility. Between 2005 and 2015, the number of workers who telecommuted increased 115%, according to a report from Global Workplace Analytics and FlexJobs. That translates to 3.9 million workers, or almost 3% of the total U.S. workforce, who worked from home at least half the time in 2015. New technologies have made it easier for people to work remotely. Branson adds that having as much flexibility as possible where you work can also make all the difference for working parents. "I lived in a houseboat when my kids were young," he recalls. "I was building Virgin. They were fooling around. I changed a nappy and I'd be on the phone. So I suspect I'll see more of my kids and family than almost any father." 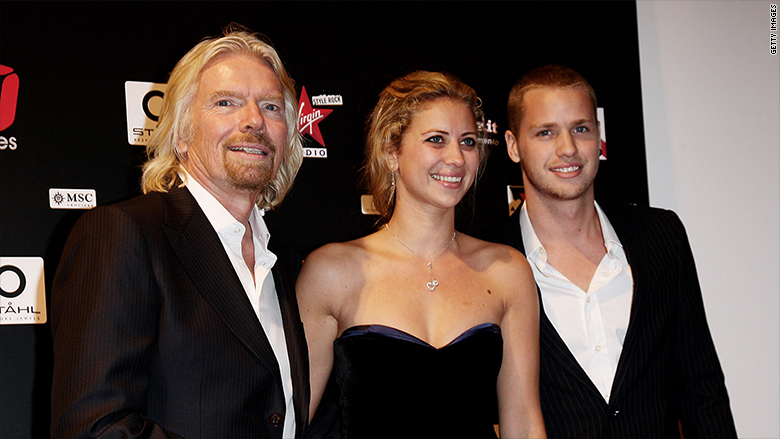 Richard Branson with his two children, Holly and Sam. Branson details numerous experiences with his children throughout his nearly 50-year career in his new book, cheekily titled Finding My Virginity. Now a grandfather of four, Branson notes "the most important, in the end in life, is your family and friends." And that, according to Branson, means you pick up the phone when your child calls from college with her test scores -- even if you are on a panel presenting in front of thousands of people in California. "I knew how excited she would be with her results, and so I was definitely going to take the phone call. But she also managed to have 10,000 people clap for her as well," Branson recalls with a smile. Branson says his children have not only inherited his appetite for travel, but also his appetite for risk. In October 2008, Branson and his kids set out to break the world record for the fastest crossing of the Atlantic Ocean in a sailboat. "None of us realized quite how dangerous the trip was," Branson writes in his book. A hurricane had formed behind them. Seeing the worried look on his children's faces, Branson and the team abandoned the mission and headed for Bermuda instead. None of this sits well with his wife of 40 years, Joan. Before Branson takes off for another death-defying feat, Joan often tells him: "If you die, it's your fault and I won't be coming to your funeral," he recalls. "She makes me sign a bit of paper every time saying, the island is hers if I don't come back," Branson jokes. (Necker Island, that is. Branson's private Island in the British Virgin Islands.) "She's no fool." Branson has not lost his appetite for adventure -- nor have his two children. His only condition, is that he insists on tagging along with them on any of their extreme adventures. "Poor Joan now has to watch all three of us heading off on big adventures," he says. One very personal adventure he plans to share with Holly and Sam will be a trip to space on Virgin Galactic's VSS Unity. "They may not come on the very first flight, but maybe they definitely will be coming very soon," he says. Virgin Galactic's VSS Unity SpaceShip Two during one of its test flights. As for when that may be? 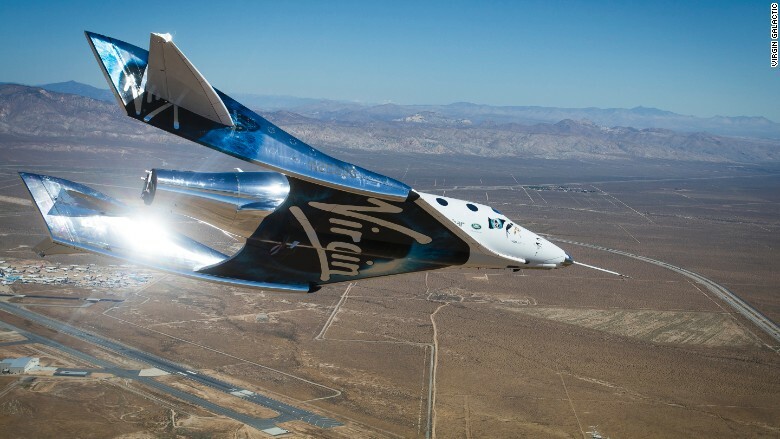 For the first time since the deadly 2014 crash of Virgin Galactic's SpaceShipTwo during a test flight, Branson is putting a timeframe on when he expects the first of the company's official flights to reach space: 16 weeks. "Maybe six months from now, I should be in space," Branson estimates. "And then, by the end of next year, hopefully, we'll have our license to start taking people up." The National Transportation Safety Board ruled pilot error was responsible for the 2014 crash. "Paying customers will start flying in VSS Unity when commercial service kicks off at Spaceport America in New Mexico," a representative for Virgin told CNNMoney. 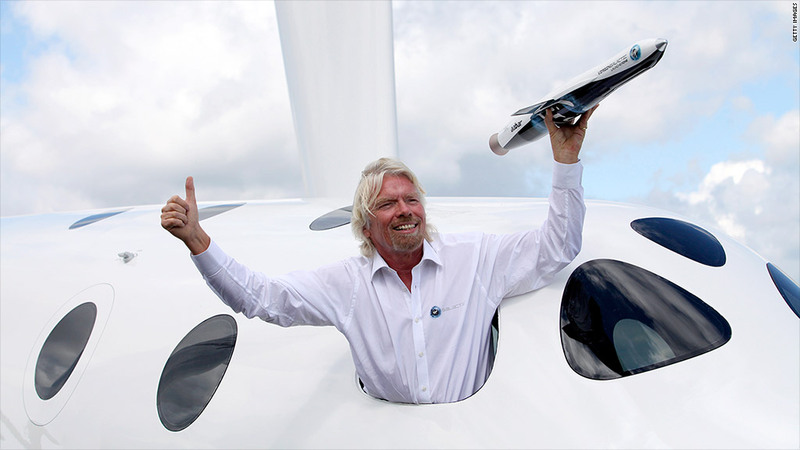 Branson has been developing Virgin Galactic for the last 10 years. Reaching space would mark the apex of his Virgin empire. "I think that almost every single Virgin company is culminating in Virgin Galactic, and it will hopefully, it'll be the one Virgin company that I think everybody who works with Virgin will be most proud of," he tells Harlow.